Be the first to share your favorite memory, photo or story of Norbert. This memorial page is dedicated for family, friends and future generations to celebrate the life of their loved one. 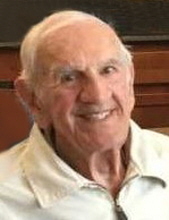 MADISON-Norbert C. Lex, age 91, of Monona, passed away on Tuesday, March 26, 2019, at Agrace HospiceCare. He was born on April 16, 1927, in Milwaukee, the son of George and Elizabeth (Schwalm) Lex. Norbert graduated from Messner High School. After graduation, Norbert served in the U.S. Navy for two years. He married Betty Pucek and together they lovingly raised five sons and two daughters. Following her passing in 1983, Nobert remarried Vera Allen with whom he spent over 30 wonderful years. Norbert was an incredibly hard worker and followed in his father’s footsteps in the elevator business. He was proud of the fact that his sons, sons-in-law, and grandsons all joined the business, taking it into its’ fourth generation. Norbert was a charter member of the IUEC Local No. 132, and was active in the local Elks Club and East side Businessmen’s Assoc. He was a man of strong faith and was a longtime member of St. Dennis Catholic Church and served in the Knights of Columbus for many years. He was also quite active in youth hockey over the years and was always shuttling his sons between different leagues and events. He was avid Badgers fan and always enjoyed watching games. One of Norbert’s true passions was his love of music and dancing. He was a professional ballroom dancer and was well known for his talent as an accordion player. Norbert was at heart a family man. He was dedicated to caring for his family and loved when they all got together. He will be remembered as a kind-hearted and generous man. He always had a smile on his face and was a perfect gentleman. Norbert is survived by his sons, Robert (Cindy), Steve (Jan), Brian (Vickie), John (Mary), and Tom (Karen); his two daughters, Joan Lex Nowak, and Patti Lex Newman; thirteen grandchildren; and ten great-grandchildren; as well as many other friends and relatives too numerous to name. He was preceded in death by his first wife, Betty in 1983; and his second, Vera just last year; his parents; and all fourteen of his siblings before him. A Mass of Christian Burial will be held at ST DENNIS CATHOLIC CHURCH, 505 Dempsey Rd., Madison, at 11 a.m. on Monday April 1, 2019, with Father Randy Timmerman presiding. Burial will be held at Highland Memory Gardens. Visitation will be held at the church from 9 a.m. until the time of the Mass on Monday. The family would like to extend a heartfelt thank you to the staff at Agrace for taking such wonderful care of Norbert. In lieu of flowers, memorial contributions may be made to Agrace HospiceCare, 5395 E Cheryl Pkwy, Fitchburg 53711. Online condolences may be made at www.gundersonfh.com. "Email Address" would like to share the life celebration of Norbert C. Lex. Click on the "link" to go to share a favorite memory or leave a condolence message for the family.